A bad report from Caterpillar and revised guidance from NVIDIA drug the indices lower. Peak earnings season is here so the news was not taken well. The markets are looking for growth and confidence from CEO's and it did not get what it wanted. The good news is that there are events at had, this week even, that could alter the outlook for earnings growth this year but we'll just have to wait and see how they turn out. This week could be turbulent for many reasons. First off it is a big data week and many of the data points on the calendar have been delayed over the last month. We should see two months worth of data for things like the PCE Price Index and Personal Income so there could be a strong reaction to the news. Not counting what's on the schedule it is possible we'll start getting other delayed data points as well. Also on tap this week is a meeting of the FOMC. The committee that determines the direction of US monetary policy is not expected alter rates but is expected to comment on the trajectory and timing of future rate hikes and possibly the end to the Fed's balance sheet run-off. What we want to see is a Fed at ease with inflation and ready to let the economy run its course without additional hikes (unless the data dictates). If the Fed indicates they will alter, slow, or end the balance sheet run-off it would be an added bonus for equity and bond markets. Perhaps the most important event this week will be the trade talks between Chinese Vice Premier Liu He and Washington's finest. The talks are not expected to bring much change to the situation but they could be a turning point. If the talks end successfully there will be a path forward, no fear of additional tariffs, and less headwind for global economies to weather. If the talks end badly we could tariffs increased again and the global economy begins to sink into the recession we've all been warned about. 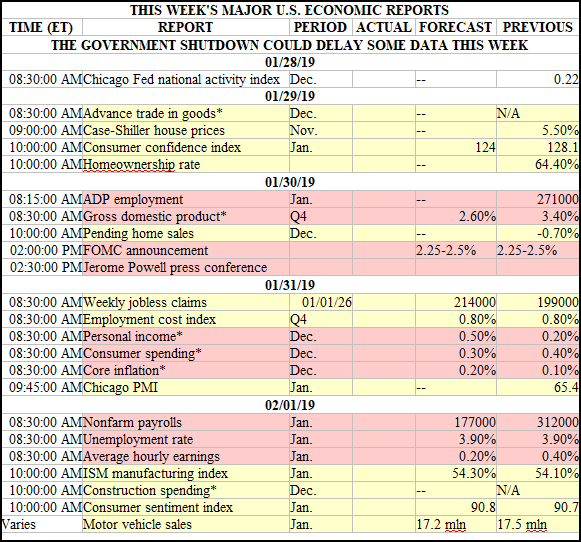 Only one economic release today but there are over a dozen releases this week including the FOMC policy statement, the PCE Price Index, the Nonfarm payrolls report, and many others. Today's release is the Chicago Federal Reserves Economic Activity Index and shows activity expanded in December. The diffusion index increased by 0.06 to 0.27 on strength in two of the four sub-indices. 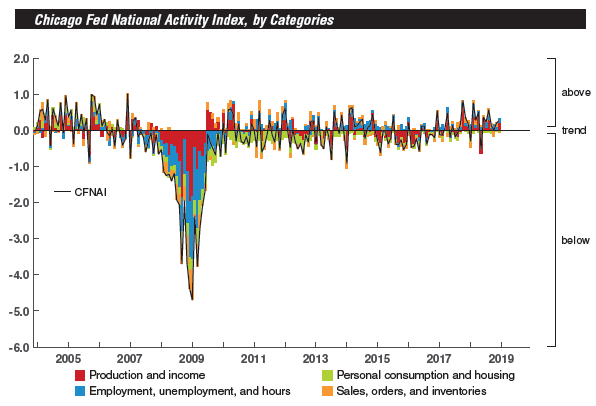 Both the production and employment-related indicators showed some increase, production showed a strong increase, while sales/orders held steady and consumption/housing declined. The decline in consumption and housing is mostly due to housing, not surprising, but should be noted in case other signs of consumer weakness emerge. 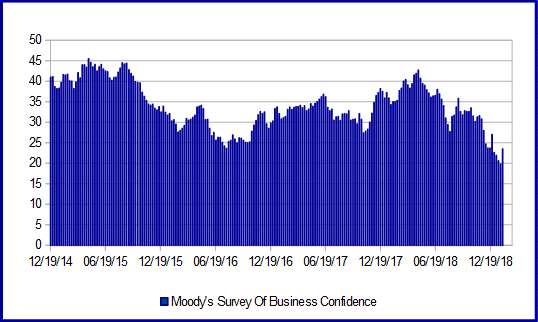 Moody's Survey of Business Confidence jumped 3.7 points in the last week but I'm not convinced there's been a reversal. 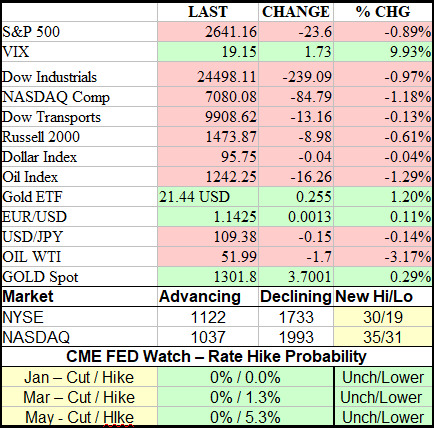 The confidence figures have rebound before and there is no reason for this one to be different assuming no change of sentiment is sparked by trade talks, the FOMC, the earnings outlook, or economic data. Earnings season is about to ramp into high gear and so far the results are good if a bit less than expected. The average S&P 500 company is beating consensus but at a lower rate than it has over the past few years. This is a concern but it is still early in the season so things could change, if not we may see the broader market move lower to correct for lower than expected growth. The blended rate for the quarter is now 10.9%, still down from its mid-2018 levels, but up from the previous week. There are 126 S&P 500 companies reporting this week, 25.2%, so it's going to be a busy one. Looking forward there is still an expectation for earnings growth but that outlook continues to worsen. The next three quarters are now only looking at 0.70% to 3.0% growth, very weak compared to last year's 20.6%, but there are brighter days ahead. 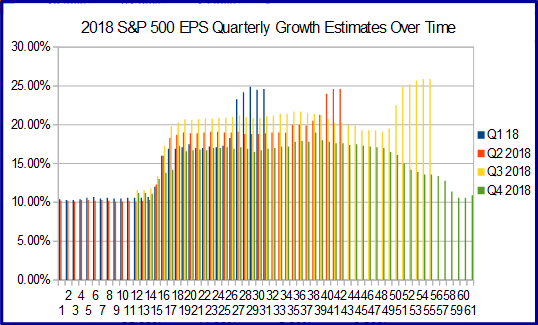 Earnings growth is still expected to accelerate throughout the year and then surge in the fourth quarter. 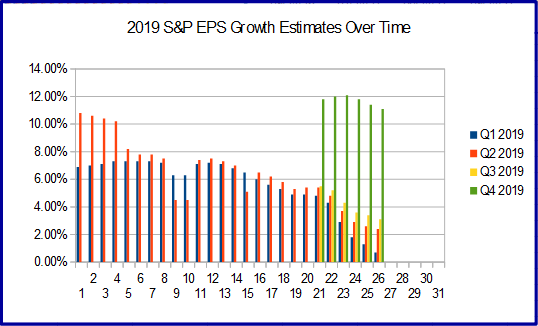 The surge should put earnings growth back in the double-digit range and projected to carry into 2019 barring unforeseen geopolitical/trade events. Growth for 2019 is going to be focused on the industrials, financials and consumer discretionary which makes today's report from Caterpillar all the more worrisome. The Dollar Index continues to drift lower after last week's stunning reversal. The index is now heading toward support targets at $95.50 and may get there before the FOMC release on Wednesday afternoon. The reversal comes on word the FOMC may curtail the balance sheet rundown sooner than expected and that is dovish in terms of policy stance. The rundown has allowed the Fed to absorb billions in liquidity and tighten the market to the point of a recession. If they do as expect we might see the Dollar Index fall through support at $95.50 and $95.00 and move to $94 or lower. This month's meeting also includes a press conference so there could be added volatility. Gold prices held steady after their surge to new high last week. 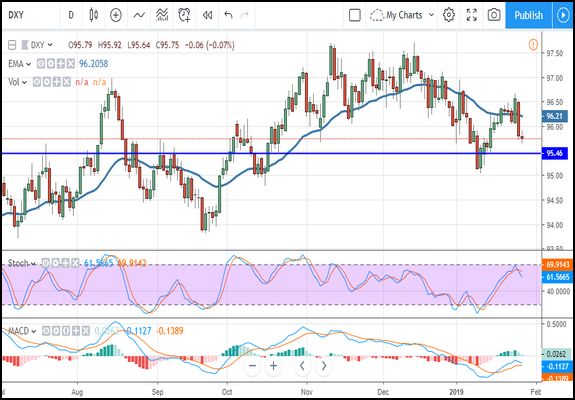 The metal is now hanging above the $1,300 level where it may linger in order to gather support. The move is driven by the weaker Fed stance more than anything else but I'm sure there is some fear-factor in the price as well. Now that price is above $1,300 the uptrend is confirmed so higher prices are expected over the near to short-term. 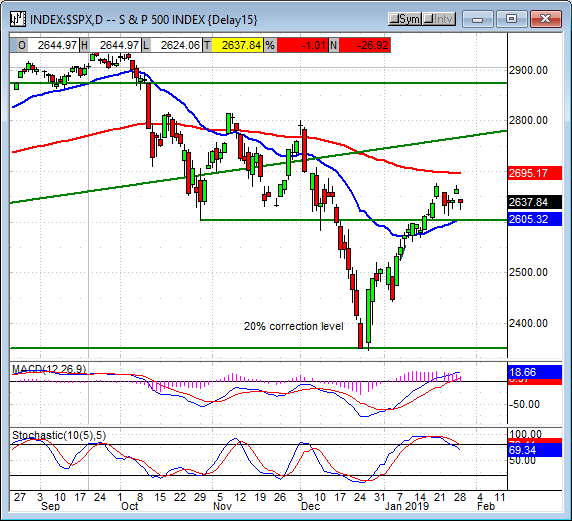 The indicators are not yet fully in-line with the break-out so caution is due. My next target for resistance is $1,320 and $1,340 with a possible move to $1,360. 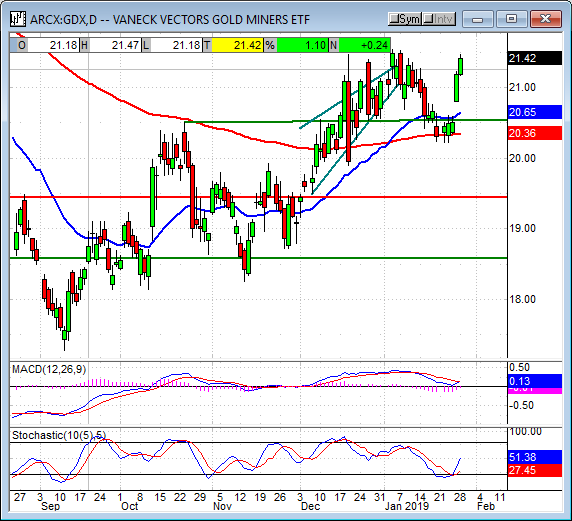 The Gold Miners ETF GDX extended its launch from major support with an advance of 1.0% in today's trading. The ETF created a medium-sized green candle pushing up to test resistance at the $21.50 level and so far there is some resistance there. 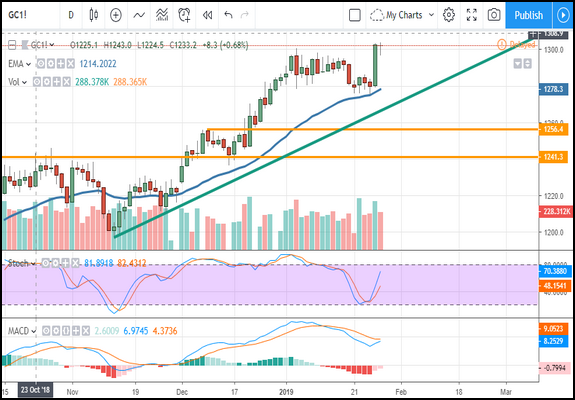 The indicators are firing bullish crossovers so it looks like there is some strength in the move, I would expect to see $21.50 tested if not broken. A move above $21.50 would be bullish and could take the ETF up to $22.00, $23.00, and $24.00. Caterpillar's warning on 2019 revenue and earnings was taken as a sign of slowing demand for oil. The price of WTI and Brent both fell more than -3.0%, WTI nearly -4.0%, but the moves aren't as ominous as they sound. 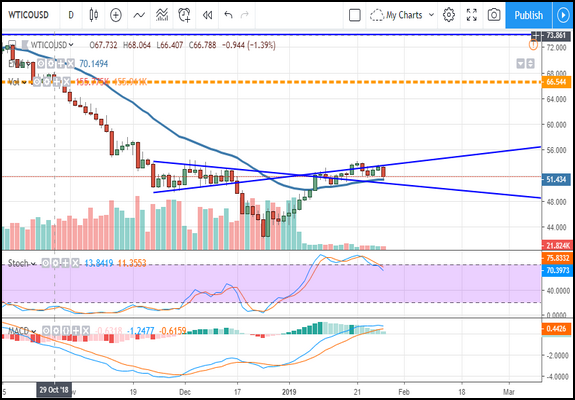 WTI is still trading within the near-term consolidation range and above the short-term moving average so support is still present. Later this week, if the inventory data is still strong and/or industrial outlook weakens, we may see WTI move lower. The Oil Index held steady in today's session and barely posted any movement. 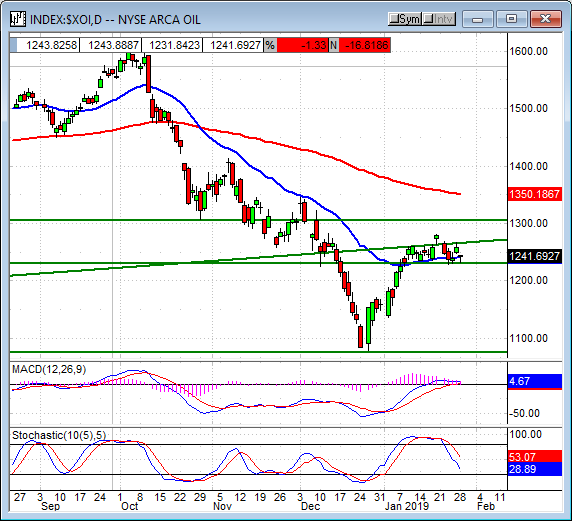 The index is sitting on key support where it may hold but not if oil prices fall. If oil prices fall back to test their lows I think we can count on the energy sector to retest its lows too. A move below 1,230 would be bearish and could take the index all the way to 1,100. NVIDIA, a leader in AI, gaming, data-center, and cryptocurrency mining chips, issued a warning this morning. The company says revenue will fall well short of current consensus due to weakness in its core businesses gaming and data-center. They cite economic deterioration in China that is bad for them but may spur President Xi to up the pace of trade negotiations. Despite the warnings, company execs were optimistic for future sales, just at a slower pace than expected. Shares of the stock fell -15% but are still above support. If support in the $130/$135 range we could see a reversal take place. There were at least a dozen small and regional banks reporting before the bell with one thing in common, growth. The regional banks are seeing growth in their net-interest income and consumer banking segments that are driven by healthy labor market conditions. While individuals may not have seen a change in their pay or earnings the average American worker has, and there are more workers than ever before, and that is driving revenue at the local bank. 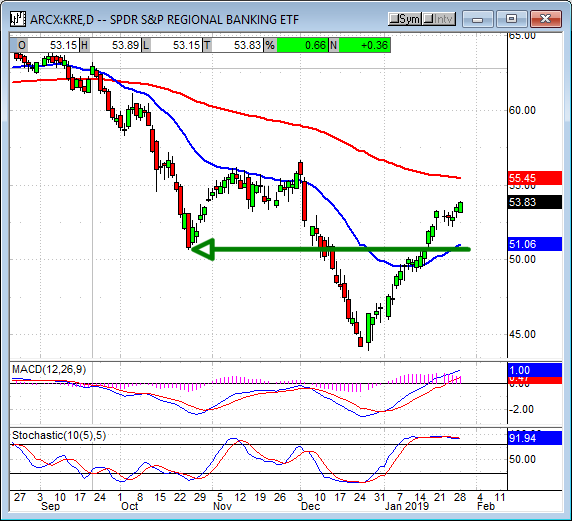 The Regional Banking SPDR KRE was one of few to see gains in today's session. The after-hours activity does not look like it will be too busy, there are some reports but nothing major and not the quantity expected later in the week. 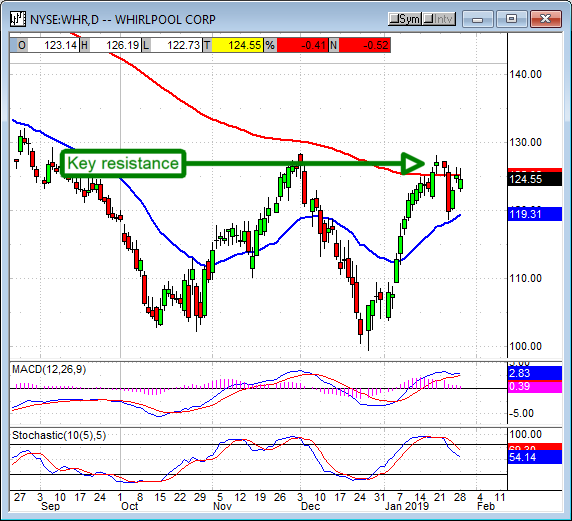 Topping the list is Whirlpool, a big name with ramifications for consumer products, manufacturing, and the industrial sector. The company was expected to post EPS near $4.25 and revenue growth of 1.1%. The stock traded slightly lower in early action and looked hopeful earnings would be OK. WHR is a good dividend payer with low payout ratio and high growth rate in recent years, if it falls in after-hours trading I would expect to see some value-buyers step in around $120. The indices were broadly lower in late afternoon trading but above support levels. The action was bearish but not a full reversal which is good, Caterpillar and NVIDIA are only two companies, there are lots more S&p 500 companies due to report this week and next. 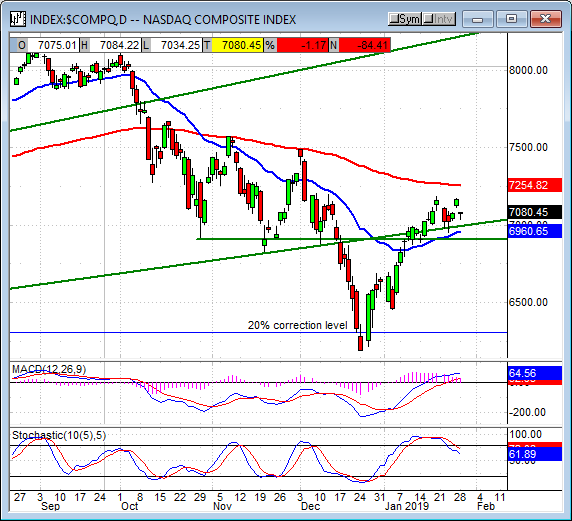 The loss leader was the NASDAQ Composite with a decline of -1.25% but the candle forming did not look that bad. 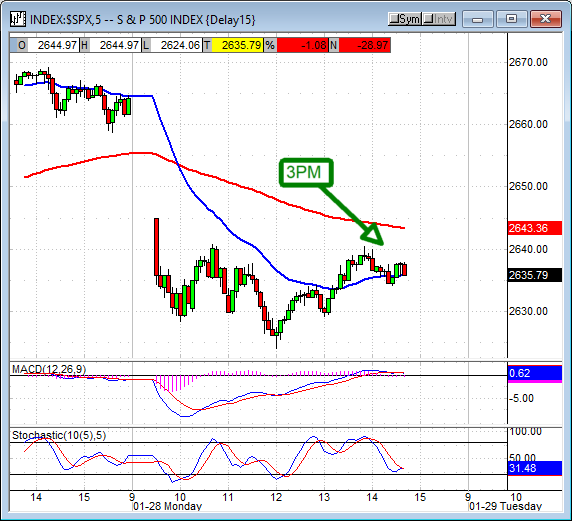 The candle was a small spinning top sitting above potentially strong support at the short-term moving average. 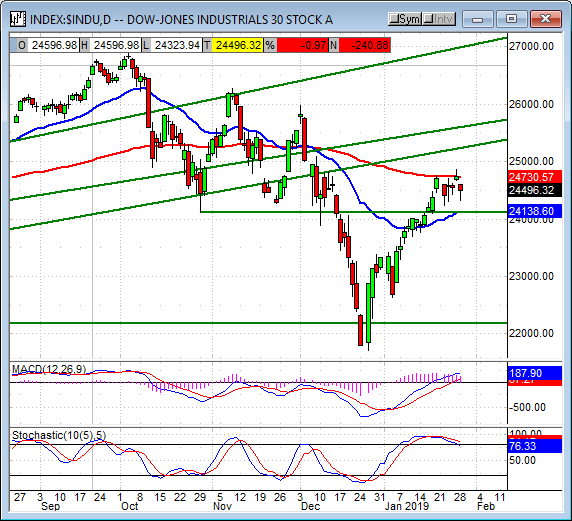 The indicators show some weakening with the recent rally but that could change with earnings. A move up would be bullish, a move lower may find support near 6,960. The Dow Jones Industrials were hit second hardest on results from Caterpillar. The industrial giant raises the question of earnings for every global megacorp so there is a lot riding on the next few reports. The blue-chips were down about -1.20% in late afternoon trading but well above support. Support is at the short-term moving average, near 24,000, and may be reached over the next couple of days if earnings don't perk up a bit. A move below 24,000 could take the index down to 23,000 or 22,000. The S&P 500 was down about -1.0% in late afternoon trading and poised above support targets, just like the tech and industrial sectors. The index created a small spinning top-type candle and does look like it will move much lower provided earnings do not disappoint. The indicators are weakening but momentum is still bullish and consolidation is occurring above the short-term moving average so I am still optimistic a move higher is brewing. 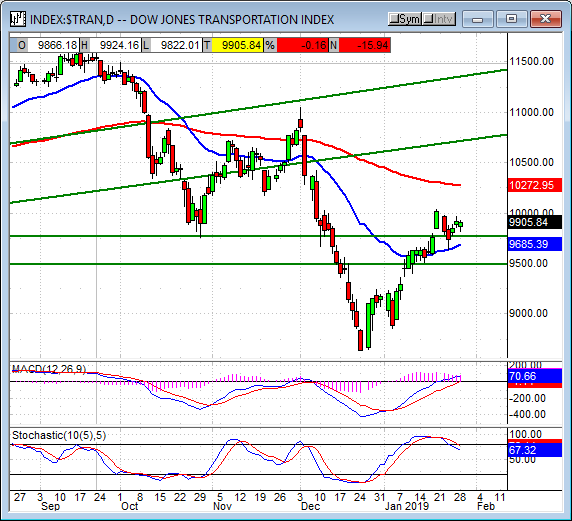 The Dow Jones Transportation Average posted the smallest decline in late afternoon trading and was forming the most bullish candle. The candle is small but green and shows support is still present above the 9,750 level. The 9,750 level is the baseline for the index recent reversal and a crucial pivot point should it be broken. Until then I am expecting a bounce to form with a possible target of 10,275 and then 10,750. 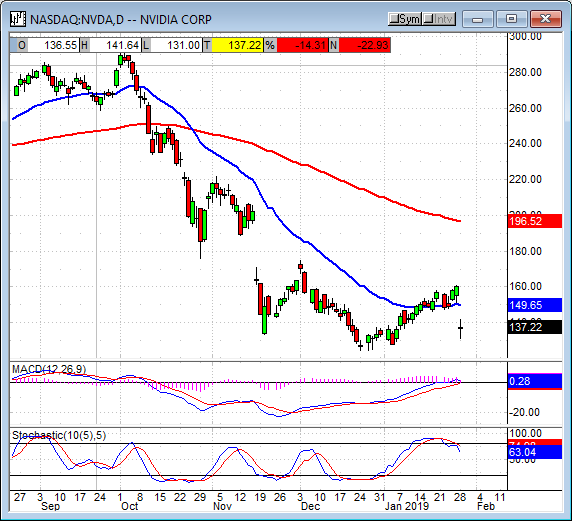 The market got a blow with this mornings report from Caterpillar and warning from NVIDIA but it was taken in stride. The indices gave up a little bit of ground but held above major support targets where they have been consolidating over the past week. There are risks this week, quite a few risks, but so long as the indices hold above their respective support levels I am optimistic a rally will follow.